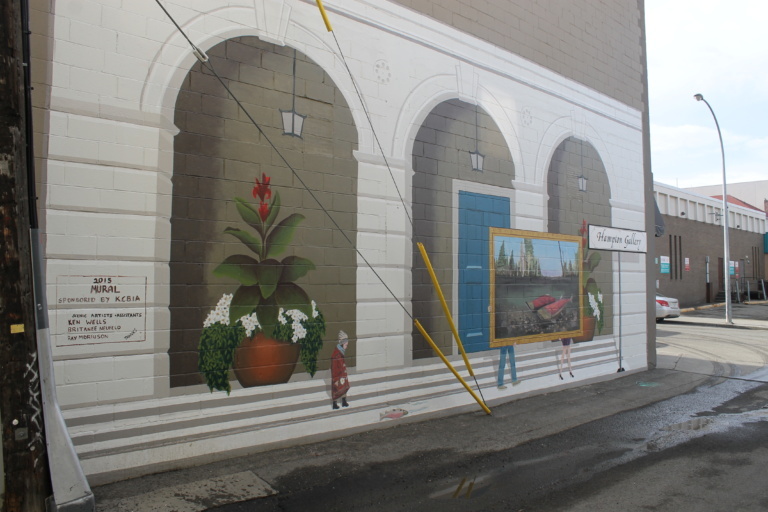 This public mural program was undertaken because we wanted to make our alleys part of the walkable, livable space downtown. 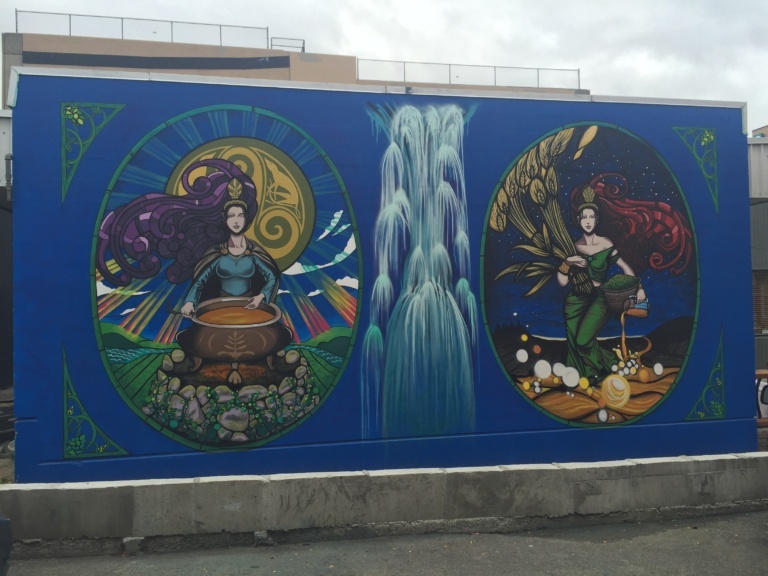 There are now a total of 29 murals in Downtown Kamloops and rather than a single theme for our murals, we wanted to create a truly eclectic collection. It’s an outdoor art gallery and like all good galleries, it features a mixture of different artistic styles! 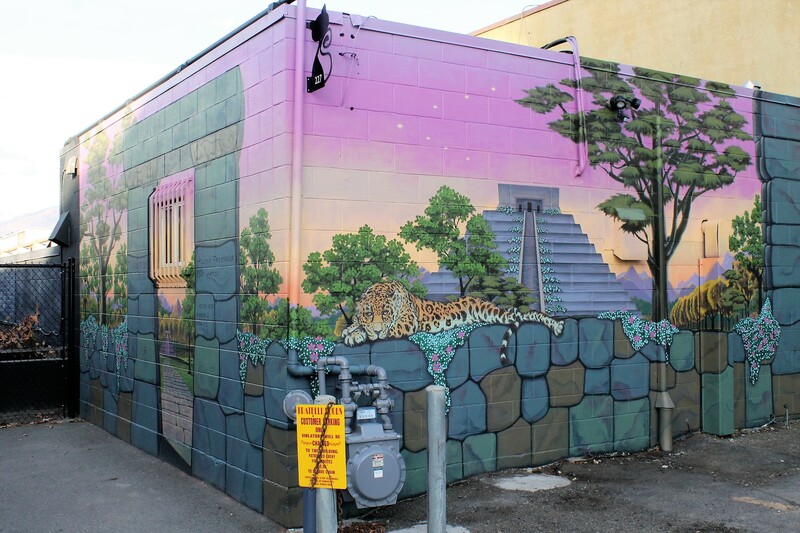 The Back Alley Art Gallery is an integral component in the KCBIA’s Complete Streets Initiative: public spaces that are friendly, supportive, appealing, and safe. This program creates community partnerships between the local business and creative communities and provides an opportunity for local artists to showcase their talents, diversify the downtown business environment, and beautify public space. 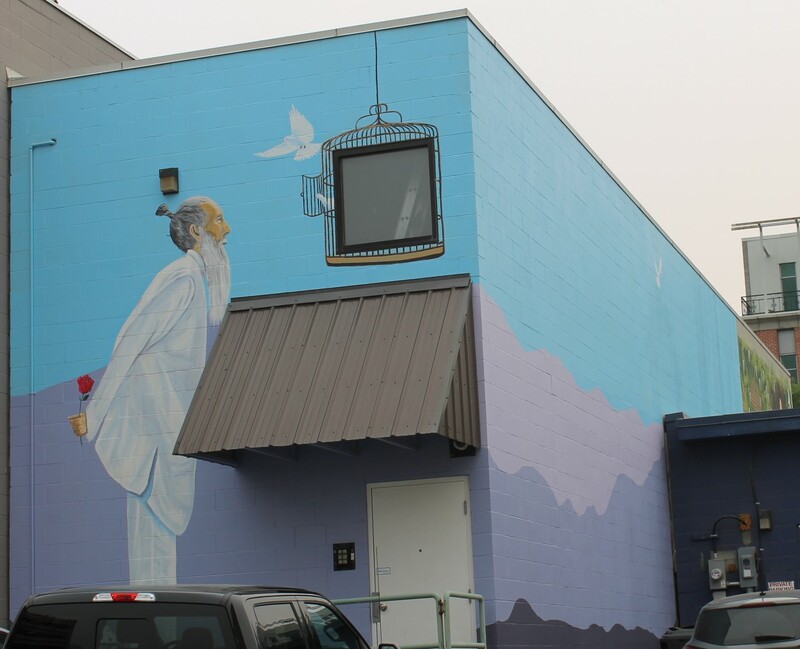 Project partners include: Province of British Columbia, Ministry of Housing and Social Development and their Job Creation Partnership, the various property owners, Kamloops Arts Council, suppliers including Sherwin-Williams Paint Store, United Rentals and the BC Wildlife Park. Through coming together we were able to take a dream and coax it into reality! CLICK HERE for a full mural map! This building resides beside the Commodore Grand Café & Lounge, The Commodore – as it is more commonly known- opened in 1927 and is both a licensed restaurant by day and a club by night. The Commodore is known for their diverse range of music, from DJ’s that specialize in hip-hop and electro to playing soft rock and jazz throughout the week. 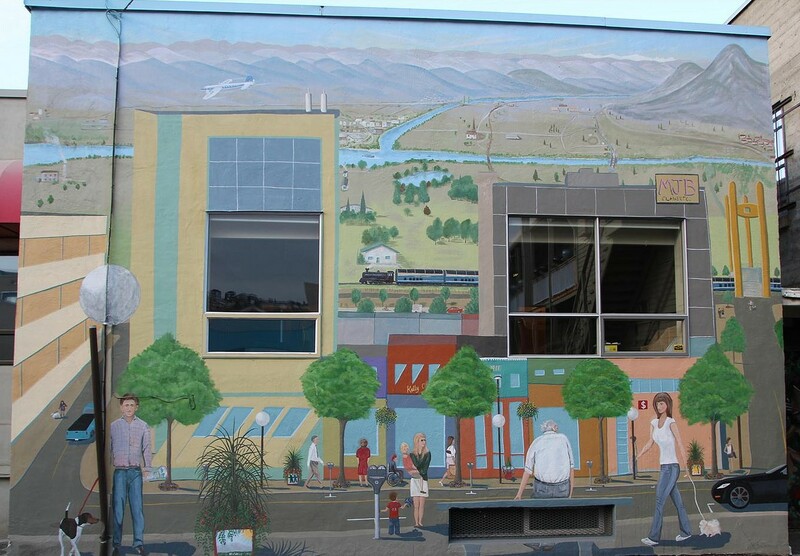 This mural echoes the contemporary architecture of the TNRD building, and honours the cutting edge vision of the architects, Peter Cardew and Nigel Baldwin in 1998. The playful combination of shape, line, and colour also speaks to the history of abstract painting — a medium often featured on the walls of the Kamloops Art Gallery. Segments of the concrete wall will remain visible, in order to balance the materials of the original building with the mural. This mural took 5 days to complete. This mural was designed with the community in mind! During the KCBIA’s 2nd Back Alley Block Party, the community was invited to throw water balloons filled with paint at the wall. 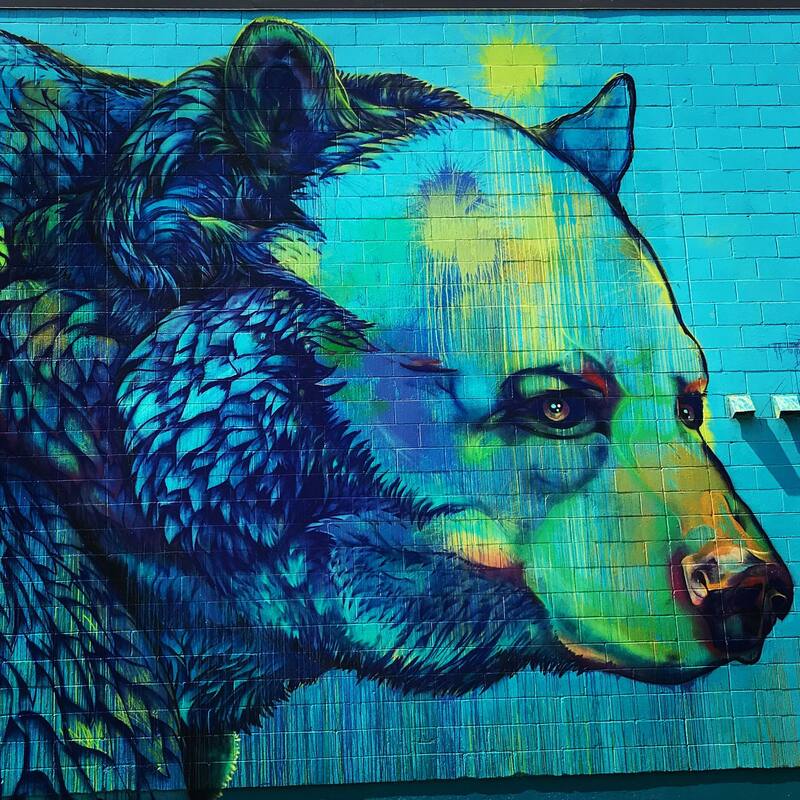 Afterwards, the artist was able to use the colours of the splattered paint as fill for the beautiful grizzly bear pictured above! This mural took four weeks to complete. This depicts an Olmec/Inca temple site, whose ruins have become overgrown by the forest. Move through the guardians at the gate, past the megalithic stone wall and drift back to the step pyramid in the background. Imagine yourself in another time and place. Drawing inspiration from diverse cultures to add depth and breadth to the Alley Art Gallery. The story behind this mural is that the Old Mystic is sending his red roses out into the world with his doves, they are received by the lady at the front, she doesn’t know from where they come. The intention of this mural is the promotion of peace and love throughout the world, without knowing who you are sending it to, or who is receiving it. The artist has designed elements within the painting to camouflage parts of the building structure; the window became the bird cage. By using this technique, the artwork is not diluted by the building. The ladies’ patio in the painting blends with the actual head office patio which overlooks Victoria Street. Remember, send it out into the universe – knowing it will be received with gratitude. 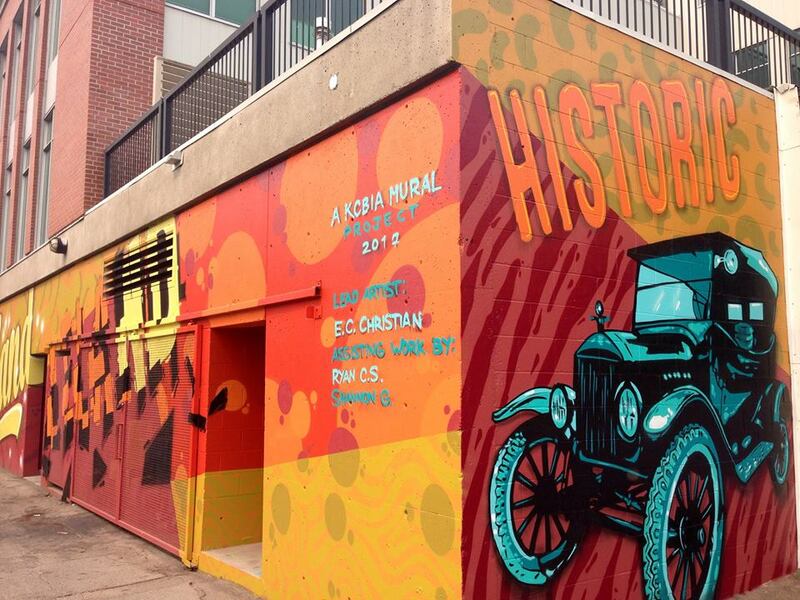 This mural was designed to celebrate the rich history that Kamloops offers. The building that stood here until 1980 was the Leland Hotel, which was built in 1905, named in 1907 but met its end in flames. Conceptually the mural pays homage to the historic Leland Hotel but in a very modern, contemporary and unusual way. 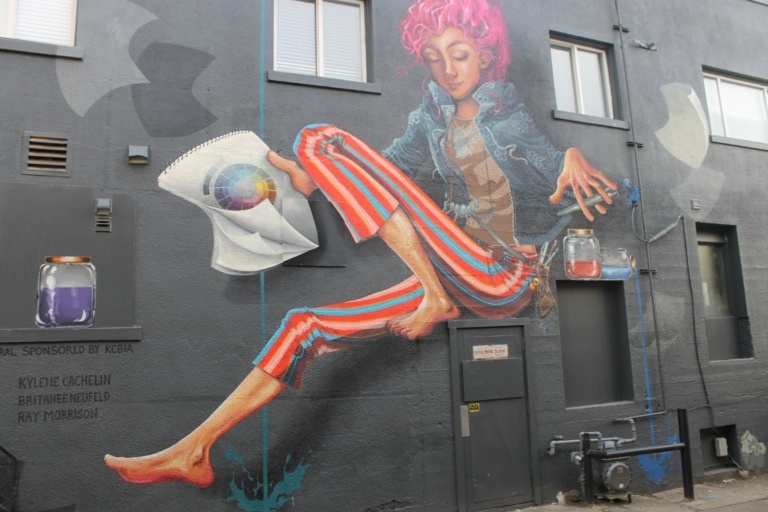 This is a popular genre of mural, so colourful and energetic this work of urban art was created with a combination of wall paint and spray paint. 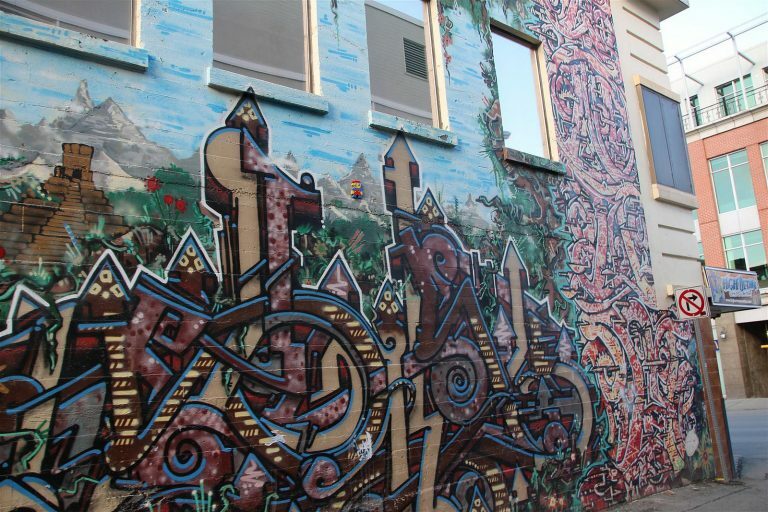 This mural is a dynamic addition to the diversity of our Alley Art Gallery. The Kami Inn parking lot was the location for the 2017 Spring Fest. During the weekend a collaborative mural was painted on the side of Jonathan Buchner Gems & Jewellery. 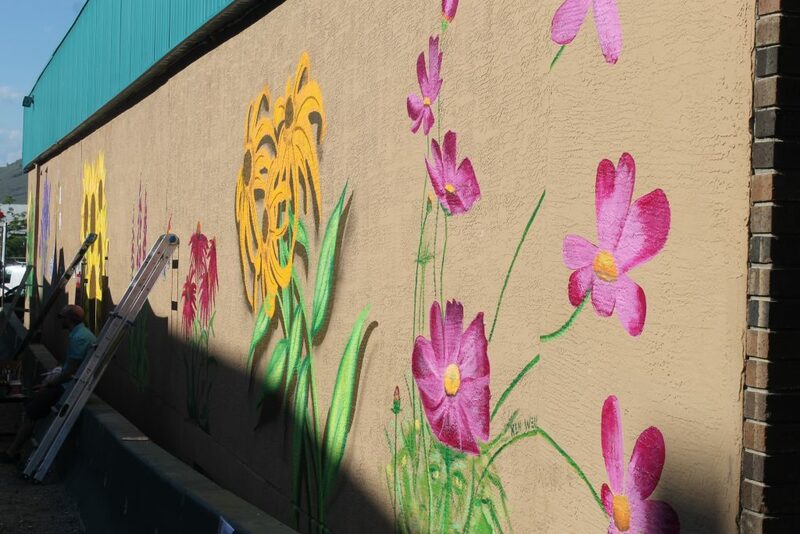 This mural consists of local wildflowers and bee friendly flowers painted in different styles by an array of talented artists. It was an art event – A weekend mural! This is an Italian architectural mural with a special point of view best viewed from the alley. The arch way creates a window to an active scene. The theme of this mural is a meeting place. The dog, a Welsh Sealyham Terrier, appears in a few murals and is a nod to the artist (Ken Wells) mother who was an artist and dog breeder in the UK. 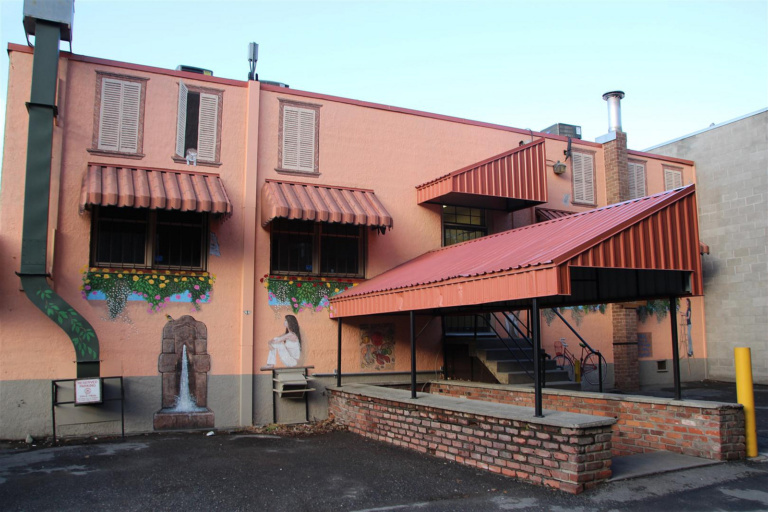 This is the back of the KCBIA office. As we facilitate the mural program, it is fitting that we have a mural too. Tyler, in the brown overalls, was actually one of the mural artists. 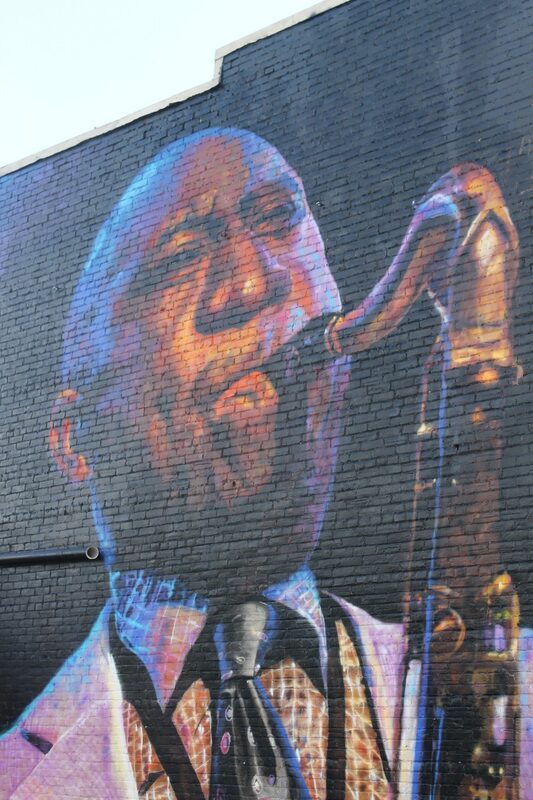 The general idea with this mural was to improve the overall look of the building with different focal points. 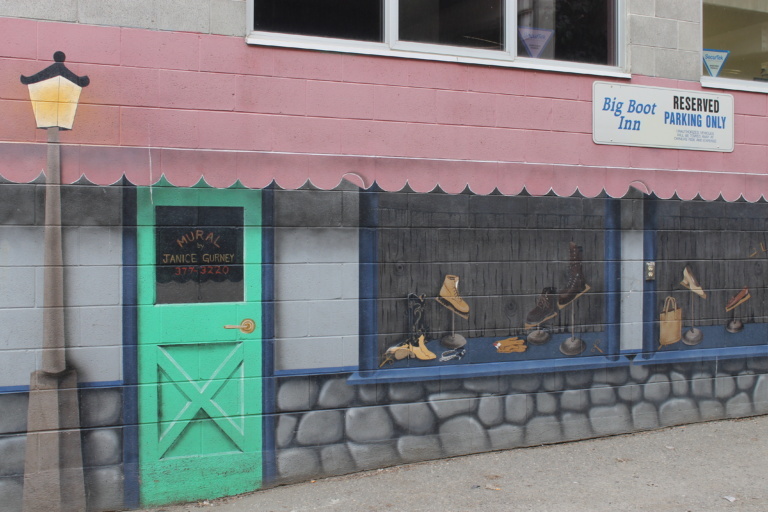 This mural recreates the look and feel of an old style, traditional shoe store. The visuals of a main street store front in the alley. Her works hang in public and private collections internationally. Locally, her artwork is proudly displayed in the Brownstone Restaurant and at the Plaza Hotel. The owner commissioned this one to combat graffiti. The whimsical “House in a Shoe’ is accompanied by a Bodhi Tree on the back of the Golden Buddha. This was a wonderfully large canvas to work with. 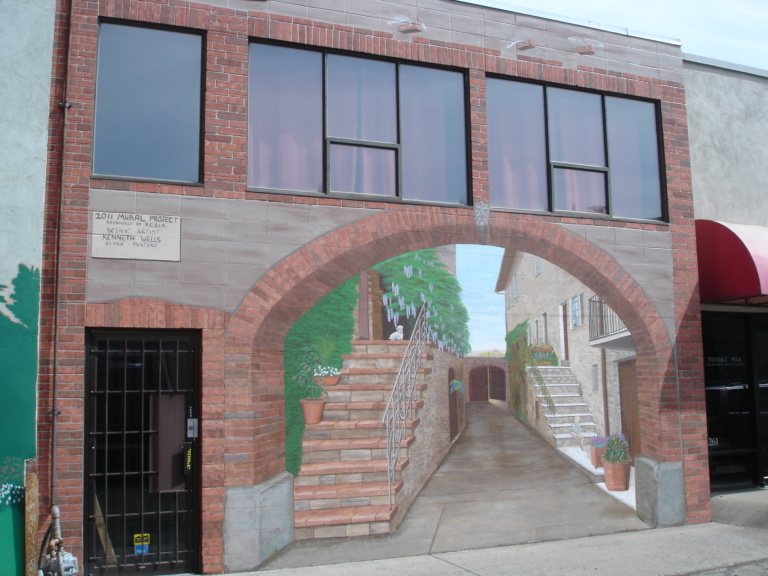 The building owner wanted something completely different from our other murals. A fun, modern, more European street art style. With art based businesses in the building, the image of an artist in her studio in the midst of a creation seemed perfectly fitting. This is a forced perspective mural, which essentially means that it looks as though it is three dimensional, but isn’t. This is a scene with many details incorporated. Notice the flying angel bricks on top show the artist’s names. The dog is used as a focal point for the boy and to move the viewers eye from one side of the composition to the other. 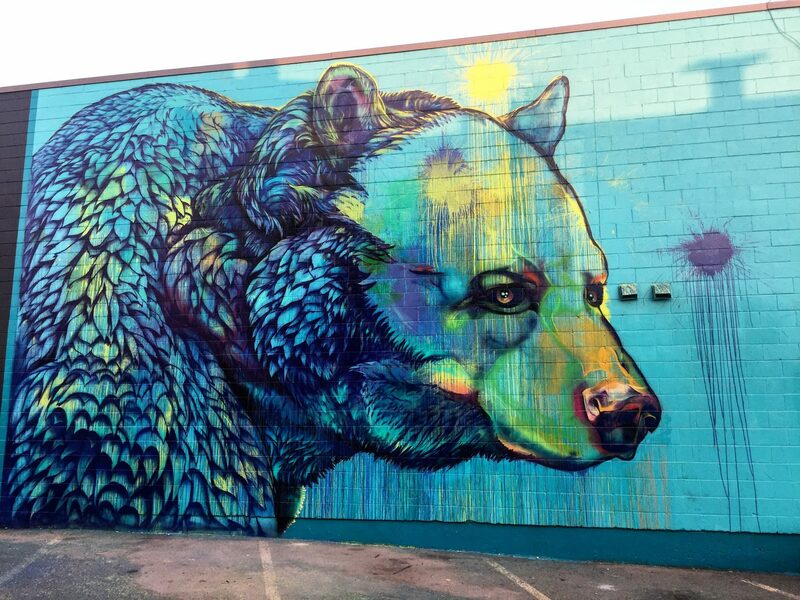 This piece incorporates all of the things that make Kamloops unique, and showcases the activities in which you can partake within our beautiful city. It is meant to represent the 200 block of Victoria Street. This is the street view you would see if the building was not here. 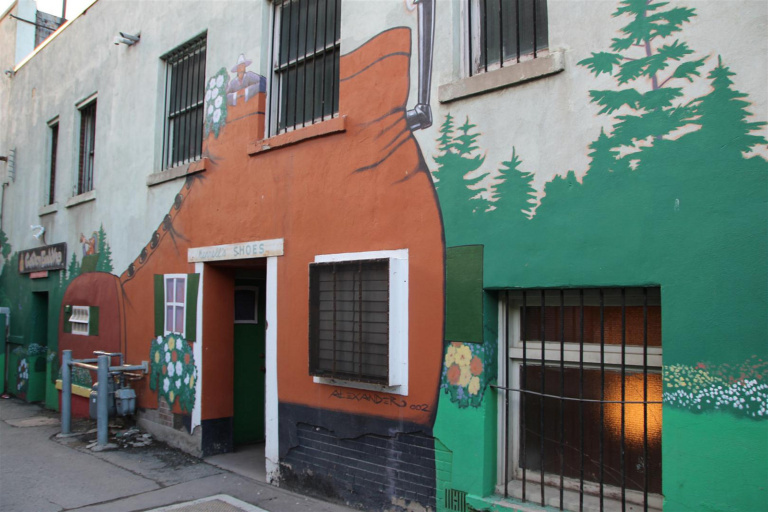 This mural, which is a completely different style than Ken’s other murals, demonstrates the variety of styles that our alleys have. Variety is one of our goals for the Back Alley Art Gallery. This mural is one of the originals and was done before the KCBIA’s mural program. 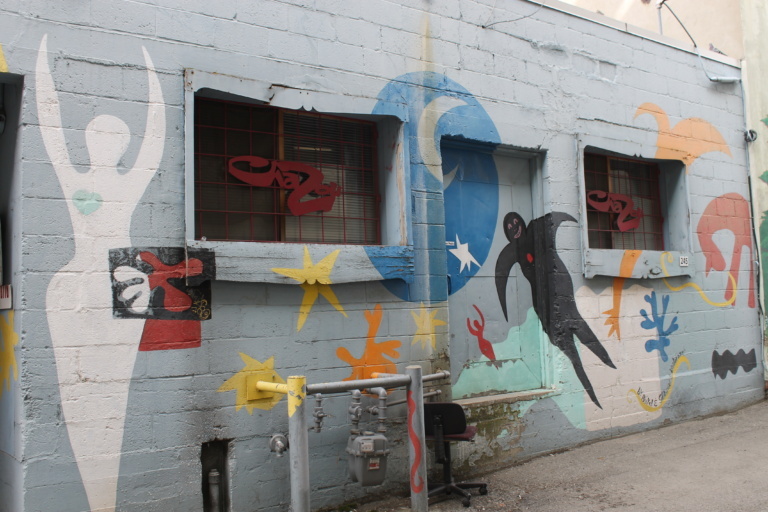 2 young men, who moved on to Toronto for a career in the arts, completed this mural around 2000. It showcases collaborative street art. If you look up, you will see a little lego Mario Bros. who appeared one night out of the dark. This wall was very heavily tagged by graffiti so the owners were happy to have a mural created here. The art represents the owner’s interest in Buddhist culture. History tells us that Kuan Yin (Kwan Yin) is the Chinese version of the male god, whom the ancient texts eulogize as the deity of compassion. The Buddhist Deity Green Tara is also known as a heavenly deity who hears the cries of beings experiencing misery. The Diamond/Triangular Mandalas in Buddhist cultures, a mandala embraces what they consider to be the four facets of life; unconscious, conscious, emotional and spiritual. This is a scene from Venice. 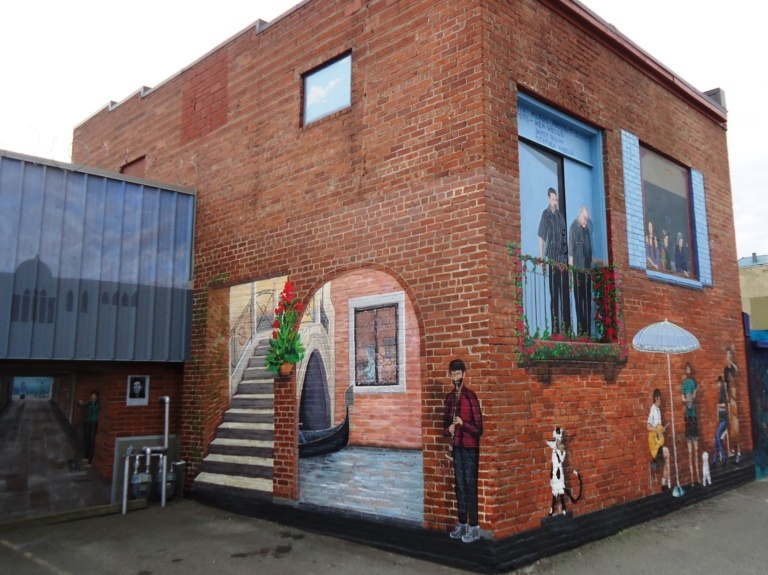 The building and business owner’s faces are worked into the mural. The owner wanted a seaside inspired fantasy visual. It was originally supposed to be just on the lower half of the wall but the artist became so inspired that he kept going. The concept for this mural is to make the viewer feel surrounded by the multiple dimensions of the walls. It took about 6 weeks to complete. 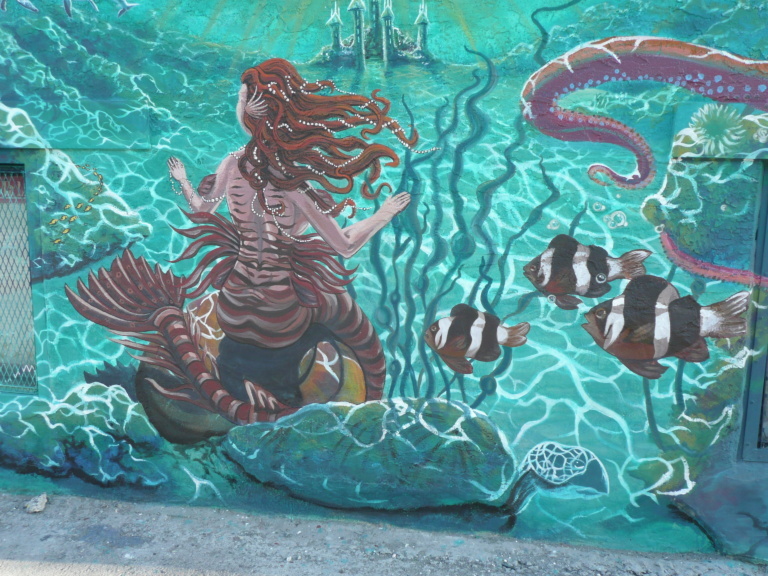 Note: the sun is coming through the water surrounding the mermaid. 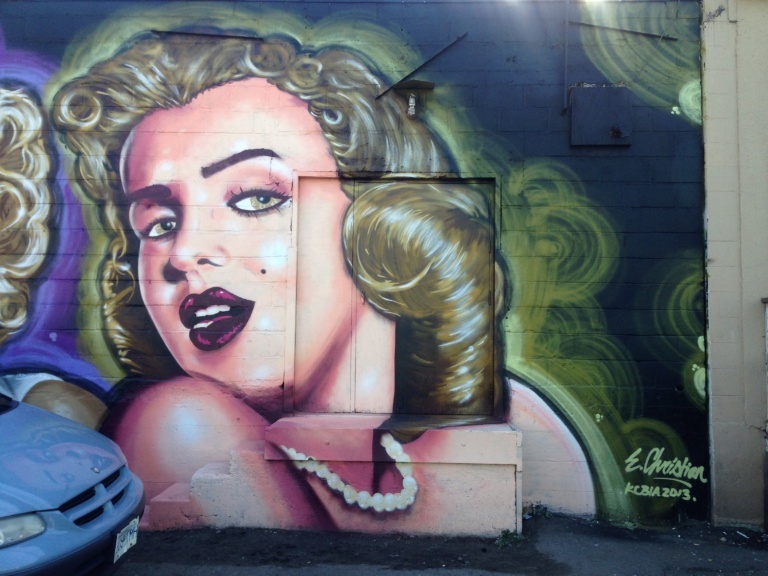 Marilyn Monroe: The owner had a poster of Marilyn that he showed to the artist. This entire piece is done with spray paint. This was our first mural of this genre and it shows the amazing detail that is possible with a good spray paint artist. 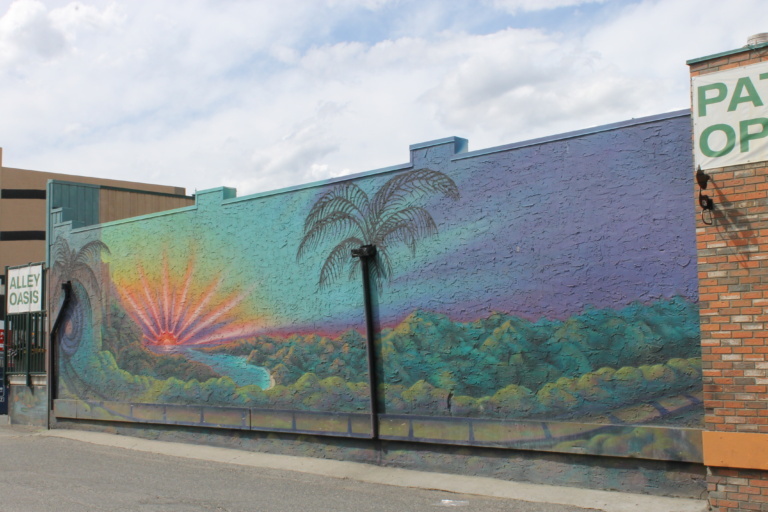 He has completed many commissioned murals within the City of Kamloops and elsewhere. Kamloops has a large Italian community, Anthony Salituro (the owner of the shop) being one of them. He gave the artist a number of photos of Italy from which Ken created this work of art. Note the 3 dimensional effects. This mural depicts a warm summer evening in 1920’s Ireland, complete with a carnival. The central Ferris wheel inspired the name of the mural. The pub “An Inghean Dhamsa” is Irish Gaelic for “The Dancing Maiden”. This dynamic street scene depicts the intrigue of various characters as they converge on The Dancing Maiden Pub. Examine the various characters, then imagine their stories, their reasons for being part of the scene; in your own way. Do you see a British spy? A German secret agent perhaps? Can you spot the almost hidden images? And above it all can you see another wheel in the sky? 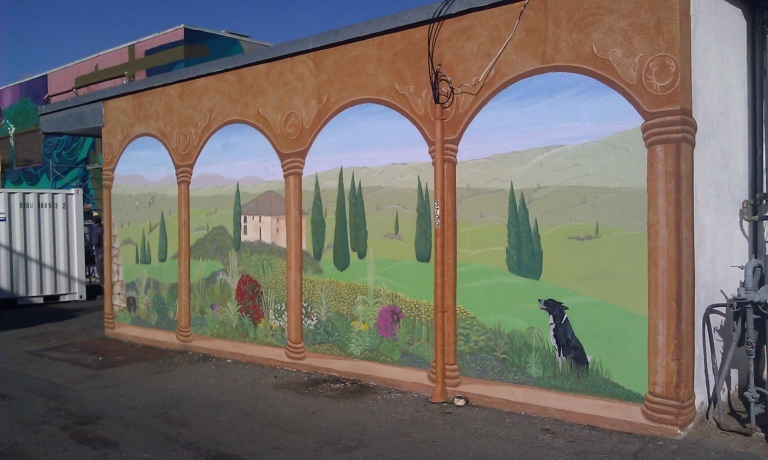 This mural was completed in the summer of 2010 by Alexander Moir-Porteous. Fredrick Fulton, a local community leader, prosecuted the infamous train robber, Billy Miner, in Kamloops in 1905. Billy Miner is known for coining the phrase “Hands Up”. After a successful robbery in Mission, BC in which Billy netted almost $100, 000, he came to Kamloops and became a respectable rancher. The thrill of train robbery was, however, far too tempting, and Miner struck again in Kamloops. Unfortunately, he only managed to steal $17, and the attempt led to his capture by the Mounted Police. Frederick Fulton put him in jail on a twenty-five-year sentence. He soon escaped and was never re-captured. The mural depicts the last of the old West train robberies by cowboys on horseback. 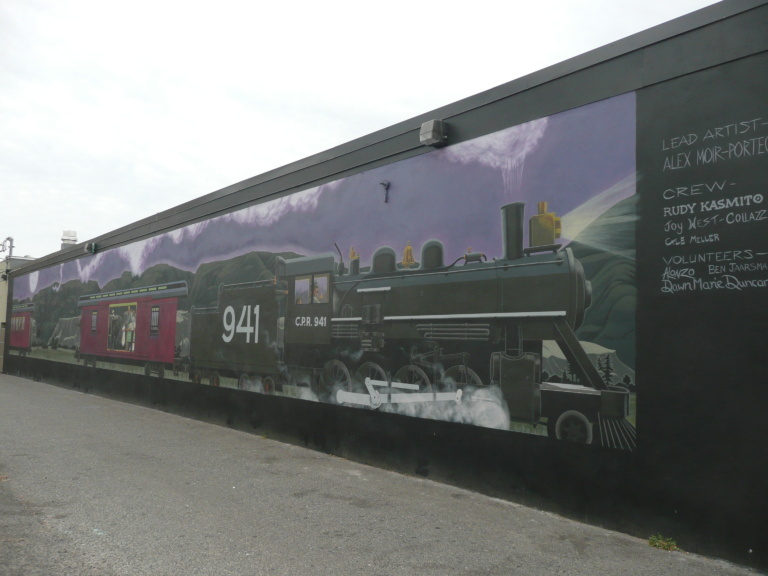 This mural is dedicated to that piece of Kamloops history. 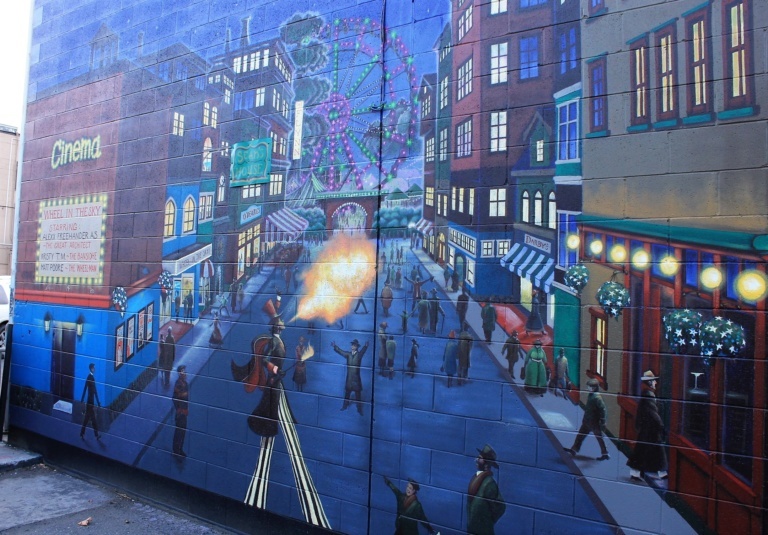 The artist took great pains to ensure that this mural was historically correct. 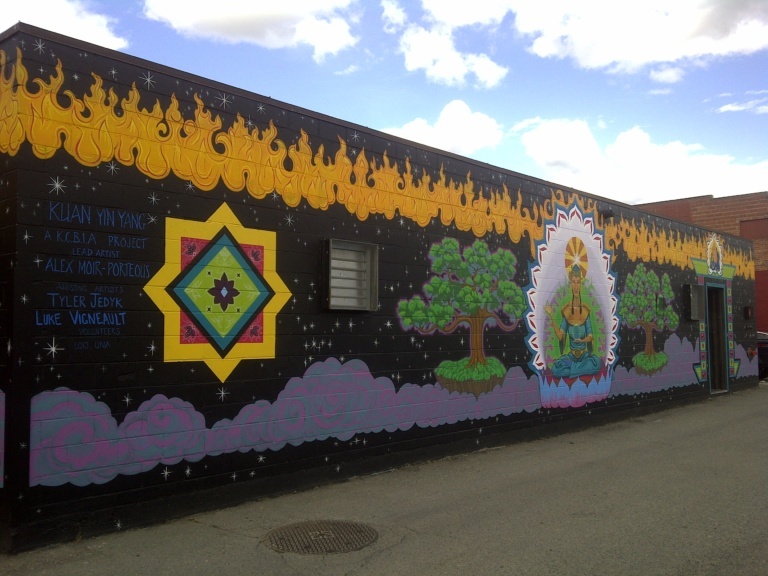 This was the first mural in the program and was completed in the summer of 2010. 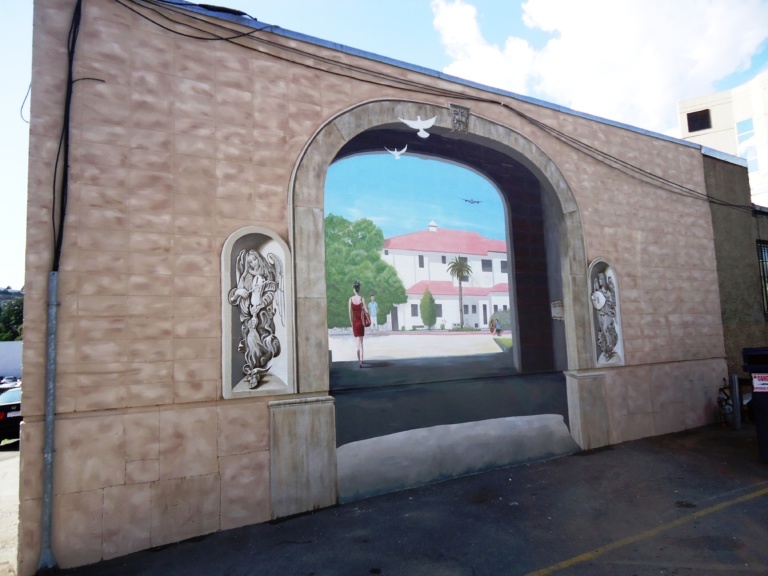 The mural showcases a path between the oak trees which is a portal to a fantasy garden. 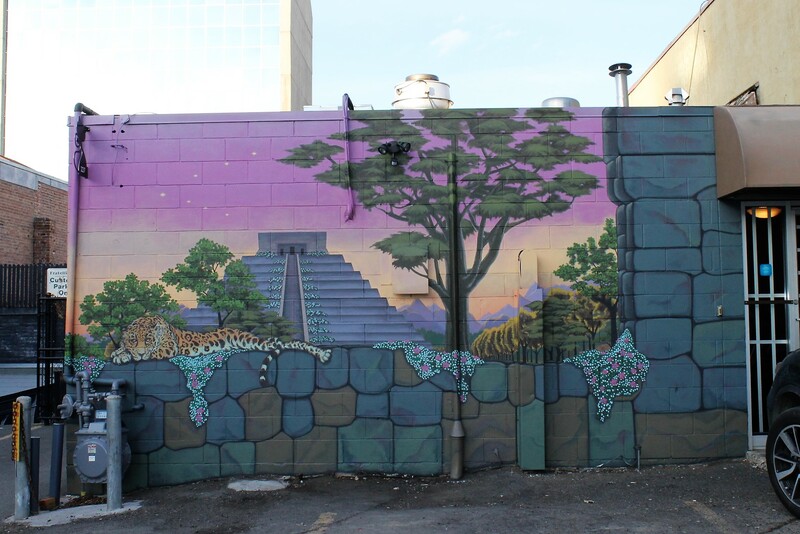 The owners wanted to create this mural to go with the oasis pub in the alley. The art wraps around the corner of the building and continues on the walls under the pub’s patio. 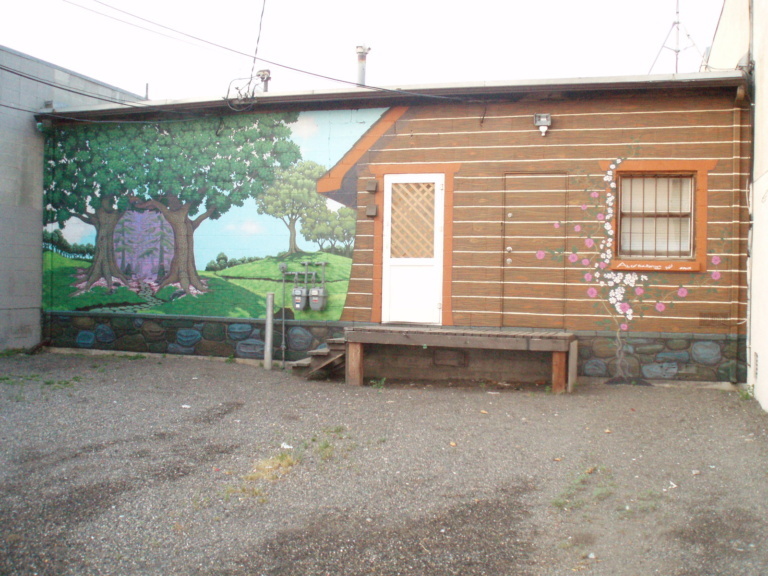 This mural was done with a mix of exterior latex brush work and high production air-gun painting. One of the three murals being completed in the 2016 season, the Red Collar History of Brewing is an ambitious look at the history of brewing throughout time and into the present. On the side of the building you will meet the goddesses of hops & barley, while on the back of the building you will meet Louis Pasteur, the man who made pasteurization and the consumption of safe beer possible. You will also see a giant barrel with the namesake of the building whose spirit lives within the beer inside. 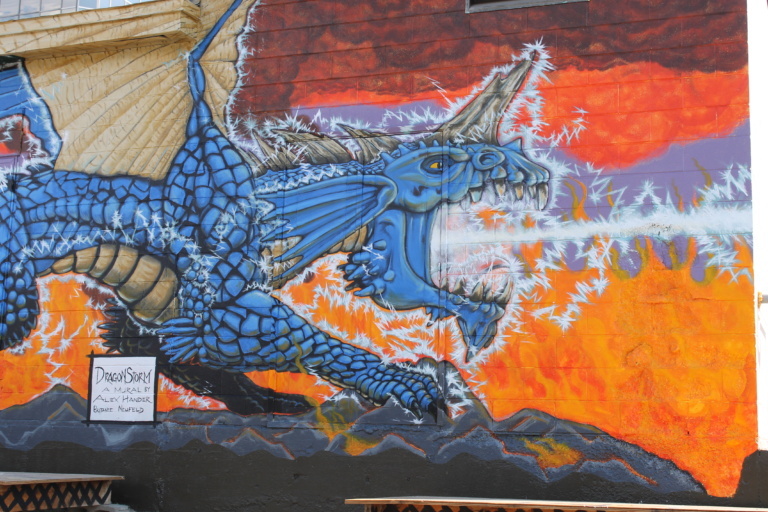 This mural, painted on the back of All Aboard Games, is based on an iconic dragon from the Dungeons and Dragons universe. This creature breathes lightning and is depicted amidst the flaming wreckage of a battle with an enemy not in the frame. Ken worked with the art gallery owner to create a design that suited the wall. Fun details you’ll notice are the feet of people carrying the painting and fish that have fallen out of the painting. This creates a feeling of action within the mural. This is also rumored to signify our declining salmon stocks and the impact humans have on spawning grounds. The title is “Organized chaos”, this idea drove the concept and the idea that without rules sports of all kinds would not be possible. 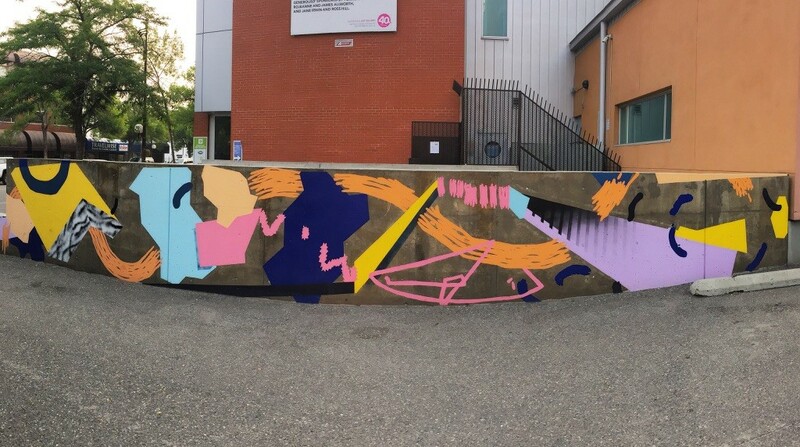 This mural is all about movement. The spiral background entices the viewer to glance across the work. Where possible the artist borrowed the actual sports team colour but always kept in mind the overall flow of form and colour from left to right. Since Service Canada is in the building, the owner wanted to have a mural that depicted the Canadian spirit and what better than sports. 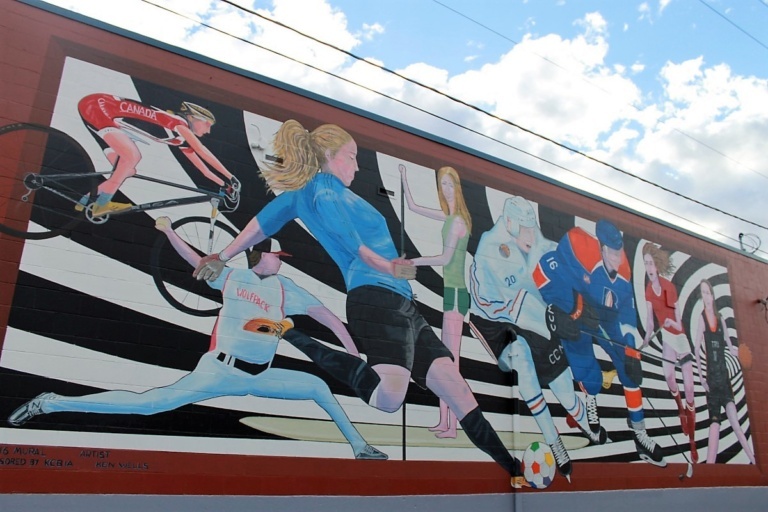 The mural includes single person and team sports and represents many sports activities that occur in the Kamloops Area.